At the end of 2011, Chema and Joan wanted to rent their flat in London while returning for Christmas to Spain. After looking for the options they had, they were not convinced about the safety level offered. They began therefore to think about ways to offer a safe solution to hosts willing to rent their accommodation to travellers and finally suggested Patricia to join the project. Alterkeys was born. Alterkeys is a platform that connects travellers looking for a short-term accommodation with property owners. We allow travellers to feel at home wherever they go, while property owners can get extra money by renting their acommodation when available. Considered as “the Alternative to hotels” with stays that are in average 70% cheaper, the listed properties on Alterkeys range from studios to villas and from cities to small villages. With a special focus on Europe, we aim at making people’s trip unique and unforgettable, either for individuals as well as for company members. We charge a small commission to the host for each reservation. With Alterkeys, the traveller doesn’t pay any commission. There is no risk as hosts will not pay until they have earned money via us. Hard-working always gets results. Never doubt it! What are the most excited about the project at the moment? Growing, it is really exciting to see how some idea you came up with in your couch can turn into a reality, and not only that but also realizing that other people trust your product and other companies want to use it. We are expanding to new areas in other continents and although it is not a piece of cake, it certainly is fun! What is the most difficult part of entrepreneurship? Entrepreneurship sometimes means being alone and not knowing what to do when facing issues. The lack of support can also be difficult to live. Success comes from hard-working, perseverance and a lot of passion for what you do. Getting hit and coming back, as simple as that. Many little things, for sure! But I would not change any of our major decisions as they get us where we are today. We have made mistakes no doubt but they have guided us to a brighter path, I have zero doubt on this. 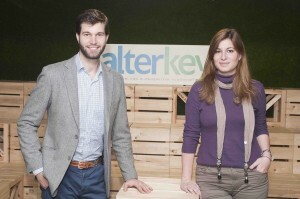 When we started Alterkeys, we thought people wanted to rent a spare room at someone’s house. After a while, we noticed that people do want to experience the city differently than before, from a more local point of view and feel at home wherever they go, but also that they would rather stay in an entire accommodation than sharing one with someone else. If you have an idea in which you strongly believe, take a step back, consider it again, and if you didn’t change your mind, go ahead. There will be obstacles, but determination is the key!